Just £400 a year can change the life of one child by providing boarding and Education..
A typical room in the girls' hostel sleeps four girls. Total capacity of the hostel after extention is 500 girls. Feel the joy of changing someone's life while we live. Put a smile on someone's face and see your own face lift. 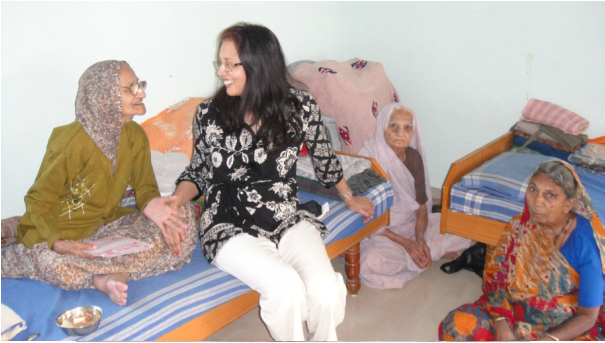 Trustee VijyaIaxmi chatting to the elderly. Inner Joy trustees have made personal commitments to contribute towards the cost of running this new home but with your help we can expand further. If you wish to visit India and see our projects for yourselves then please contact the trustees. TEL: 0208 954 6481 . We provide decent accommodation for our valued supporters.